Sunrise over the ocean, sunset behind the coconut trees, stars reflecting in the water like diamonds; this is what frames your daily life over here at Ray's Place. Here, you are reminded of how beautiful the world is. Once in your vacation home, let yourself be charmed by the gentle sound of the slow rolling waves on the beach, grab your binoculars when spotting a pod of dolphins passing by, or stay up to enjoy the moon rise over the ocean. It is our pleasure to welcome you here to our little slice of paradise. We offer a clean and functional apartment with a breath-taking view over the Atlantic ocean. In addition to all the attractions you have planned to visit there is plenty to do right here on property: you are welcome to enjoy a barbecue cookout, a leisurely swim in the warm waters right off the property, a kayak excursion, or simply relaxing beachfront at the tiki. The beach is your backyard... snorkel gear comes in handy, so do water shoes and a fishing license. Across the street is the beginning of a section of the Florida Keys Heritage Trail that leads you all the way to the town of Marathon. We particularly like to go for a walk there early in the morning when a variety of birds are out and about. These include cardinals, mangrove cuckoos, white-crowned pigeons and yellow throat warblers. The Grassy Key Outpost restaurant is next door offering a nice selection of dishes, it is also a convenience store. In our neighborhood, Tursi, Gambit and friends are waiting to put on a show for you at the Dolphin Research Center. Home to Flipper in the 60's, DRC is located 1/4 of a mile from the property. These are merely suggestions in addition to all the wonderful things that are yours to discover throughout the Florida Keys. We are so proud of our Grassy Key Island that we had to boast about it! - Two beach chairs provided. -Private washer and dryer on property at no additional charge. Laundry soap provided as well. -Conveniently located in the middle of the Keys at mile marker 58. Ideal for day trips from Marathon to Key West, Key Largo and Islamorada. *Boat fee is $10 per day due upon arrival. We only accept boats that are 17 ft or smaller. The mobile home that could accommodate up to 6 guests, mentioned in the reviews below, suffered devastation from hurricane Irma. This listing is now advertising a one bedroom oceanfront unit. Please let us know if you would like to reserve by check. On a beachfront property, the unit itself is less than 100 feet from the ocean. Partial views from living room and front windows of bedrooms. Partial views from living room and front windows of bedrooms. The accommodations were lovely and just what we needed. We were very comfortable. On the down side there was no dishwasher as listed, and the washer and dryer were outside, unenclosed, with no hot water plumbing. The owners were still recovering from hurricane storm damage and had done a very nice job on our unit. There is additional work needed on the surrounding our side area. They are very nice people and we enjoyed our chats with them. The owners were very helpful and friendly. The accommodation was clean and had fantastic views and accessibility to the ocean. You literally stand outside and there it is. A perfect place to get away from it all. And if you like spending time in the water this is the ideal spot. We both feel really refreshed after staying at this really quaint spot in the Keys. This unit sits right on the water and had everything we needed for our visit to the keys. 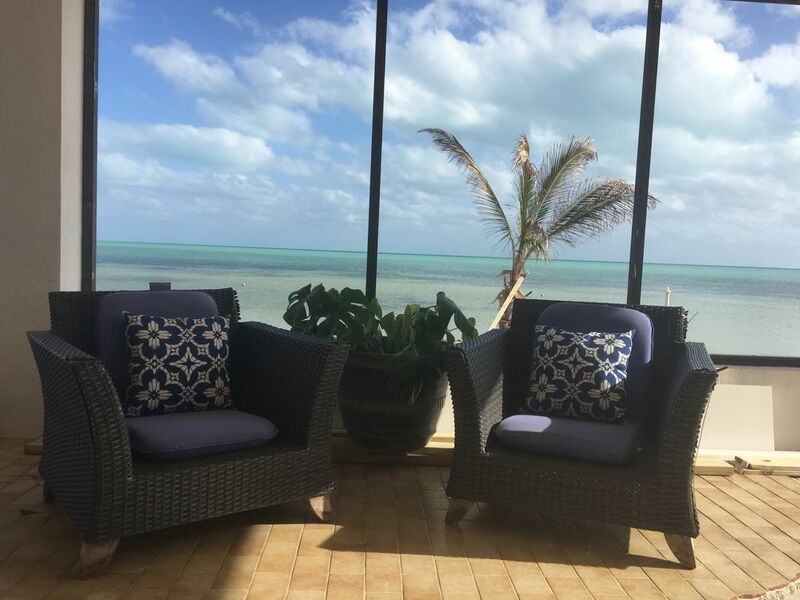 This unit had everything we needed, great location, sits right on the water and has lots of extras (kayaks, mostly private beach) and is a real local Florida Keys experience. We hope to return soon. We loved our week long stay at Ray's Place. This property is clean, comfortable and conveniently located. What a treat to wake up on the water every day and have coffee on the porch. We will definitely be back soon. We were there for 9 days, and it was awesome! It is almost private, with no hordes of people under foot. Your porch is literally 15 feet from the ocean. There were kayaks available, and a tiki hut for lounging. The apartment has everything you need to cook if you like. Flat screen TV with cable. Wifi is available, too. Very comfortable, and the owners were onsite and available for any of our needs. Near enough to all the sites, and other islands, but far enough away to feel more secluded. VERY happy with our time there! Rates are subject to change. They are secured once booked and contract is signed.